Have You Heard About the Health Benefits of This Ancient Spice? | What's Green with Betsy?!? Have You Heard About the Health Benefits of This Ancient Spice? Turmeric is finally getting the attention it deserves. 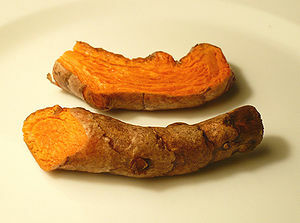 A member of the ginger family, this orange-colored spice is the main ingredient in curry and has been used for centuries in Middle Eastern and Southeast Asian cooking. It’s also a remedy in Ayurvedic and Chinese medicines and, along with ginger, is now being recognized as one of the most potent natural anti-inflammatories available. 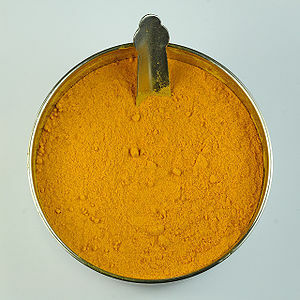 For non-medicinal uses, its potent orange color makes turmeric a great all natural dye. Try it for tie-dyeing or dyeing Easter eggs! Ironically, it’s also used to whiten teeth. Though it comes in supplement form, (consult your doctor before consuming supplements) it’s best to use it as a spice. I try to add it daily to my diet, which is easy now that I discovered this delicious recipe for turmeric tea from 101 Cookbooks. You’ll be surprised how good it is. Work the turmeric into the honey until it forms a paste. You can keep this on hand, in a jar, for whenever you’d like a cup. For each cup of tea, place a heaping teaspoon of the turmeric paste in the bottom of a mug. Pour hot (but not boiling water) into the mug, and stir well to dissolve the turmeric paste. Add a big squeeze of juice from a lemon, and a good amount of black pepper. Enjoy! Stir now and then as you drink so all the good stuff doesn’t settle to the bottom, or top off with more hot water as you drink it. Get healthy and stay healthy with turmeric! Information compiled from http://www.mnn.com/food/healthy-eating/stories/the-amazing-health-benefits-of-turmeric, http://www.top10homeremedies.com/kitchen-ingredients/10-health-benefits-of-turmeric.html, http://www.101cookbooks.com/,and The Okinawa Program by Bradley J. Willcox M.D.,D. Craig Willcox, Ph.D & Makoto Suzuki, M.D. Actually, I’ve read some on the great properties of turmeric, but have been afraid to try it. Does it have quite a strong taste? I have a hard enough time getting ginger tea down! It really doesn’t. Try the tea. It is delicious and quite sweet with the honey- a great way to get turmeric in your diet, and very warming!!! OK, maybe I’ll get brave enough! Good for you. I dont think you will be disappointed. You can also try using a little less turmeric if you want. Please let me know what you think about the tea, okay? I’ll try to remember…but I’m out of it right now, and we can’t get it in the village! You will sometime. What village do you live in? It’s called Scerni, in the province of Abruzzo. It’s beautiful, lovely climate, a real community feel, an abundance of fresh & natural foods. But for ‘speciality’ items not the place to shop. Turmeric is not used in Italian cooking! No it isn’t. It’s not really used in everyday, healthy American cooking either. That’s why I like the tea! Your village sounds delightful! Enjoy!! Thanks, and if you ever get to this part of the world, look us up, so you can enjoy it too!